The volumes of this expanding series are devoted to a wide range of sacred renaissance motets with Latin texts, and contain a mixture of well known and unfamiliar pieces, some of which are published for the first time. A perfect example of the young Britten's masterful vocal writing in a Christmas choral suite destined to become a major repertoire work. Songlist: Christ's Nativity, Sweet was the Song, Preparations, New Price, New Pomp and Carol of King Cnut. Every Christmas Eve for decades, the world-renowned Choir of King's College Chapel, Cambridge has broadcast the Festival o Nine Lessons and Carols worldwide on BBC Radio (Carols from King's is also televised by the BBC every Christmas annually). It never fails to inspire and appeal by bringing together readings from the Christmas story with the singing of traditional carols in which all may join: classic Christmas arrangements for the choir and exciting newly-composed anthems that often become choral classics. For countless people the broadcast of Nine Lessons and Carols is a major part of the Christmas experience. Now the King's College Director of Music, Stephen Cleobury, has created this album of forty-six of the most enduring choral pieces from the Festivals. Thirteen are published here for the first time, ten were specially commissioned for King's and seven are carols for choir and congregation. Wide ranging in sources, this collection includes arrangements by King's directors of music David Wilcocks, Philip Ledger and Stephen Cleobury and leading contemporary composers such as Richard Rodney Bennett, Bob Chilcott, Jonathan Dove, John Joubert, Roxanna Panufnik, Arvo Part, John Rutter, Peter Sculthorpe, John Tavener, and Judith Weir. Christmas at King's includes a preface by Stephen Cleobury and a useful appendix of readings with relevant repertoire from the collection for those choirs who want to present their own Festival of Nine Lessons and Carols. A collection of anthems for unaccompanied SATB chorus. Completed in 1952, Poulenc often returned to traditional forms of French church music popular in the Renaissance, such as the motet, that had fallen out of favor in the late eighteenth century. Following the narrative of the nativity, Poulenc intended that the movements be performed together. Collection of four motets which were originally composed as personal holiday greetings to family, friends and colleagues. Includes excellent performance notes. John Joubert's compositional range is considerable, yet it is with his short choral works in the Anglican tradition that his mastery has been best appreciated. Here for the first time collected in one handsome volume are a dozen of the finest, with texts from both the biblical and non-liturgical. This anthology from a lifetime's output is convincing proof of a composer who still has much new to say in this most demanding medium. Work in 12 movements celebrating different aspects of Christmas time - winter, the sleeping child, tidings of peace, thanksgiving - with words ranging from the psalms to new texts by Carol Barratt. The scoring is for mixed chorus with an optional second chorus suitable for children's voices, and trumpet, keyboards, percussion and string orchestra. An anthology of carols and anthems by Kenneth Leighton, one of the most distinguished of the British post-war composers, chiefly regarded today for his choral output. This anthology includes many pieces that are less well known, and find themselves in no other collection. Arranged for mixed voice choir SATB and keyboard. 'Alleluia' was commissioned for performance at the 1999 National ACDA Convention. A hushed chant is woven into dramatic musical lines and lush harmonies that later fade to an ending of quiet splendor. With the grandeur of a more challenging work, this piece sings easily, enabling accessibility to a variety of performing groups. Spevacek has 'Lo, How a Rose E'er Blooming' in a sensitive, transparent fashion with lush harmonies and textual contrasts. 'A Jubilant Gloria' is an exceptional work that offers driving rhythmic excitement from its fanfare-like opening to its exhilarating conclusion. This sophisticated piece sings easily and sounds gloriously full. Fill your performance space with the glory of a German Renaissance Christmas with selections from this outstanding collection! Mixed choruses from high school through professional will appreciate the clean, well-edited editions. Some of the most exciting and original contemporary composers of a cappella sacred music are gathered together in this superb collection. Specially geared towards the choirmaster who is looking for something special to perform at Christmas. The Augsburg Choirbook for Advent, Christmas, and Epiphany is an exciting collection of choral music for the season. Includes SATB, two-part and three-part settings of much-loved liturature from the Augsburg choral library as well as newly composed settings. This comprehensive collection will immediately appeal to directors, singers, and listeners. The New Oxford Book of Carols (1992) was born of the need for a practical collection presenting carols either in their original versions (where such a concept was relevant) or in versions that respected the essential character of the melodies and their texts. The original 700-page book, which contains alternative versions of many carols, also offers an extensive historical introduction and notes to individual carols, from which the information below is summarized. The word "carol" has had a variety of meanings, starting as a dance-song in the Middle Ages. Carols are now almost exclusively associated with Christmas, and their subject-matter is either midwinter cheer, or the conception and birth of Christ. While modern secular practice is to sing them before Christmas, they formerly belonged to the period between Christmas eve and Epiphany. Our own criteria for selecting carols re that the content must be narrative, contemplative or celebratory, the spirit simple, the form normally strophic. Beauty in simplicity best describes Greg's new Latin setting, Adeste Fideles, for the Christmas season. The unison singing gently seated above a fluid piano accompaniment develops into a musically lifting chorus that will bring out the best in your young singers' voices. The B section, more bold and deliberate, resolves back into the softer verse and chorus, creating repetition in learning. Available for TB voices as well, this piece creates a wonderful opportunity for your male singers to sing with heart and confidence. Available separately: TB, 2-part, PianoTrax CD. The miracle of Christmas is expressively portrayed through the peaceful, reflective atmosphere of this lovely song recorded by Amy Grant. Available: SATB, SAB, SSA, ShowTrax CD. Performance Time: Approx. 5:15. This lively arrangement for SATB chorus and piano with solo violin and string bass included in the octavo and an optional string orchestra accompaniment is based on a sturdy American hymn tune with a text by Reginald Heber. A banjo inspired piano accompaniment provides sparks while the tune is presented first in unison, then in canon, next adorned with mirrored countermelodies, with the refrains growing in intensity following each verse. This setting of the famous chant melody Puer natus in Bethlehem will be a versatile addition to all types of Christmas programming from concert to worship. It may be performed in Latin or English with handbells or chimes providing a simple bourdon accompaniment. Duration: ca. 2:30. With homage to Bruckner and Messiaen, the gentle phrases and rich harmonies of this contemporary Latin setting will resonate throughout your performance space. Sleep, Jesus. Thy mother smiles when she sees such gentle slumber. Sleep Jesus, gently. Duration: ca. 4:40. Here is the great Gaudete melody from the Piae Cantiones in a buoyant and accessible setting by Kirby Shaw. Featuring hand drum and tambourine and new English lyrics, this work makes an excellent Christmas processional for all types of ensembles. The buoyant and joyful song by Pietro Yon is set in sparkling style for SSA voices! This treasured melody is known and loved the world over and will make a marvelous treble choir addition to Christmas concerts! Available for SSA, Piano and Flute. Flute part included in choral octavo. Duration: ca. 4:15. 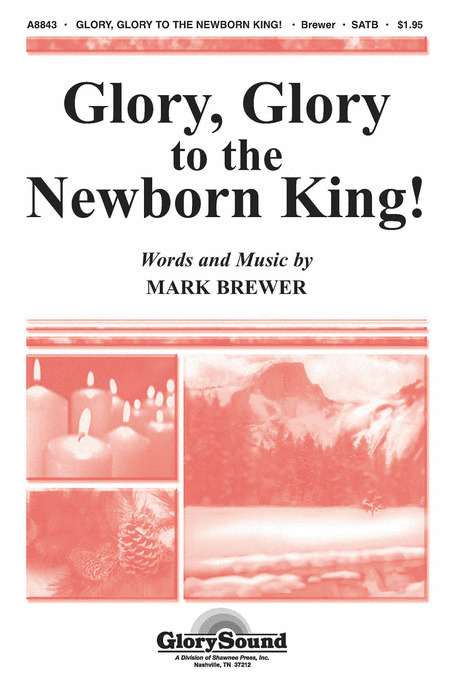 Mark Brewer : Glory, Glory to the Newborn King! Uses: Christmas, Youth Choir Scripture: Luke 2:8-20 Here is a fresh and exciting seasonal song from new contributor Mark Brewer. The text takes us to the Judean hillside and the angelic invitation to praise. The music has the flavor of an islands gospel, infusing the whole piece with a distinctive joy. Perfect for that special place in your holiday sacred concerts! Abbie Betinis : Hail, Christmas Day! Uses: Advent, Concert Scripture: Matthew 24:27-30; Isaiah 60:1-3 With a tip of the straw hat to barbershop singing, this new TTBB arrangement of an Advent best-seller will be a unique programming moment for your men. The quickly learned theme delivers the hope and joy of the coming Light in a cheerful quartet style. The inclusion of the spiritual My Lord What a Morning provides contrast and depth. Available separately: SATB a cappella, TTBB a cappella. Duration: ca. 3:01. Bright and rhythmic, with fresh, contemporary choral textures, this original work works well as a concert opener or processional. Well-crafted voice parts make it well-suited to mixed choirs from high school, church and community. Duration: ca. 1:30. Utilizing a traditional Latin text, fiery piano accompaniment and mixed meters, John Leavitt's popular festival piece is challenging, but definitely worth the extra effort. Use the optional percussion to further intensify this dramatic Christmas anthem. Available: SATB, SSA, TTBB. Performance Time: Approx. 2:50. Here is the joyous carol with Latin and English texts in a flexible and accessible setting that will create many performance options. The piano accompaniment is optional and the vocal parts are varied and colorful making this ideal for Christmas concerts and services. Greg has had great success setting familiar lyrics to gospel-styled musical arrangements. Here is a new addition for the holidays! The Latin text is limited and used only for the chorus. Greg incorporates the lyrics of Angels We Have Heard on High for the verses and the break down section of Glory Hallelujah builds into a rousing key change and chorus with hand claps and vocal adlibs. Voiced for all age levels, this will be a favorite of your students this holiday season. Available separately: SATB, 3-part mixed, 2-part, StudioTrax CD. This is a gospel transformation of the ancient German Christmas carol. The rhythm is changed to 3/4 throughout, the melody is adorned with passing tones that create graceful arcs, and the piano accompaniment is filled with gospel-style rhythmic and harmonic gestures. The awe and wonder of this contemporary Christmas classic are masterfully portrayed in this beautifully orchestrated setting that will envelop your listeners in a warm sonic tapestry. A wonderful selection for school, community and sacred concerts. 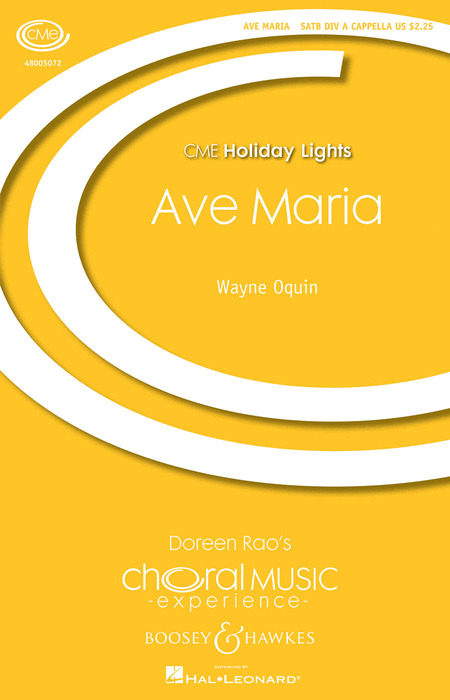 Uses: Christmas, Concert This movement from the composer's larger work, Alleluia! Puer natus est nobis is a sensitive, almost haunting setting of the traditional Latin text. A repeated chaconne-like progression forms the foundation of the work while a soprano solo rises like a prayer above the choral texture. Gentle dissonance requires a purity of tone and a careful attention to dynamics and balance. Donald Bailey, Choral Director from Baylor University, has created a beautiful Christmas selection for a cappella voices. In this setting, the choral parts flow through tender suspensions to warm resolutions. Although a sacred text, the piece will find a place in many college and good high school venues as well.